What if you found one thing to be grateful for every day? How would that change your life, your outlook and your relationships? 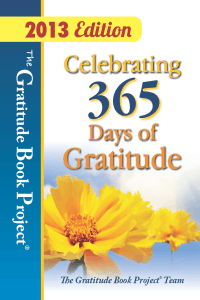 This paperback book was compiled by The Gratitude Book Project team, and shares 365 reasons to be grateful throughout the year. I encourage you to pick up a copy today and see how the simple act of gratitude can change you life! People from all walks of life join together in this collection of essays, one for every day of the year, about the things, people, circumstances and events they’re grateful for. Need a pick-me up? How about a gratitude adjustment? Look inside, you’ll be grateful you did. Celebrating 365 Days of Gratitude is brimming over with appreciation and inside you will find evidence that harnessing the power of gratitude can be a life-changing force. These true life stories are about more than the polite “thank you” we casually exchange every day. They’re testimonials to the people and things we often take for granted. Purchase here to receive an autographed copy, or visit any of the fine booksellers below.